Hey! Sorry that today's post is coming so late in the day, I just haven't had a chance to write it up until now! 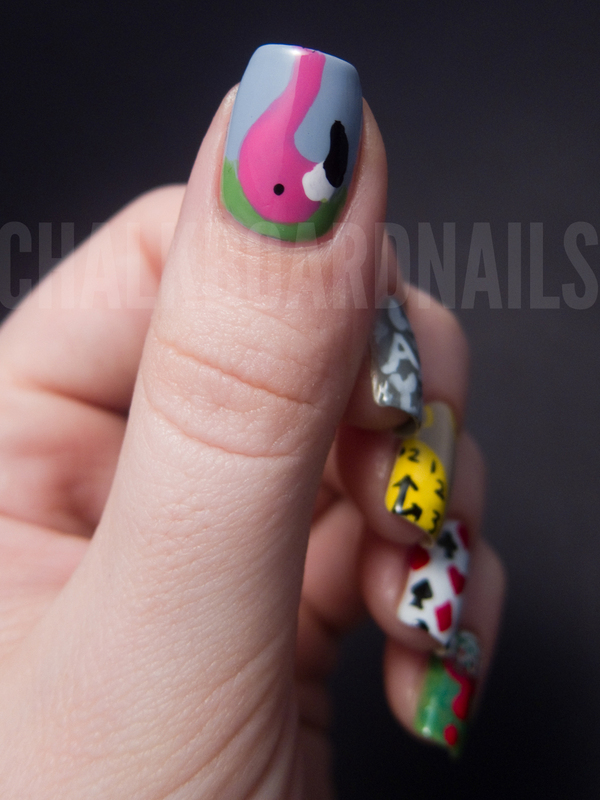 I did these nails for a contest on Freestyle Nails on Tumblr. The theme was "muse" and for my muse I chose the world of Wonderland! She actually announced the winners this afternoon, and I got second! Lets talk about each nail. The thumb is one of the flamingoes that Alice used to play croquet... that's why it's upside down in the grass! The pointer is the caterpillar's hookah smoke asking Alice, "Who are you?" The middle is the White Rabbit's pocketwatch. The ring is the Queen's army of cards. The pinkie is a white rose being painted red. Here are all the colors used in this entire manicure... cause I'm feelin' ambitious! All nails were freehanded with a small nail art brush. I had to re-do a couple of them once or twice, but I am really loving the way they came out. 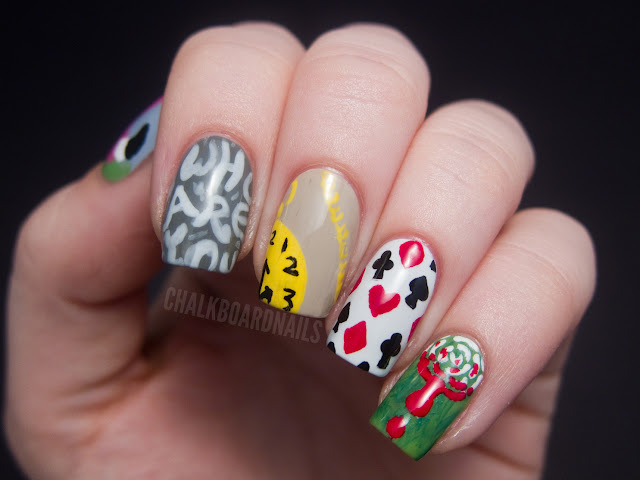 I love the stories and loved depicting some different events and characters on my nails! Though I will say, it was really tough to choose! There are so many awesome places for inspiration in the stories. This is amazing! 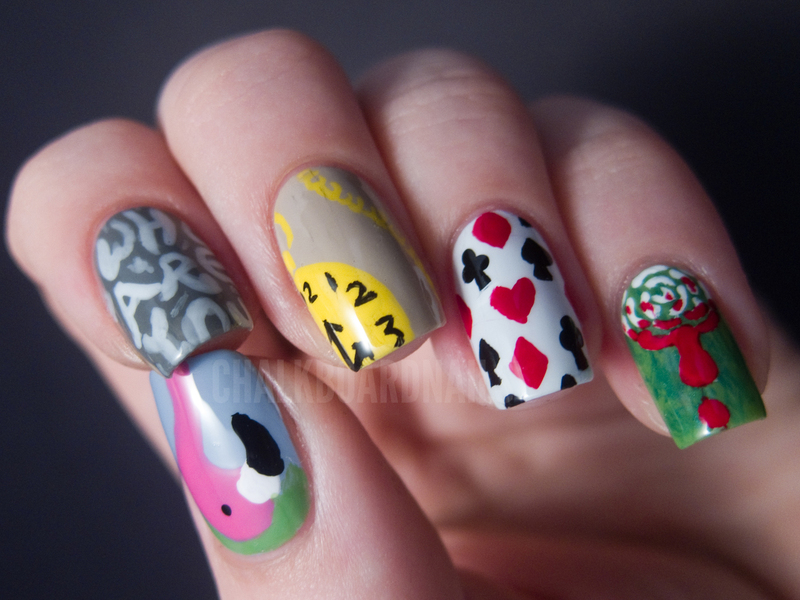 I really would like to learn how to do nailart! Awesome. I love this so much. This is so cool! I especially love the "Who are you?" It just looks so awesome! ADORE this! Alice in Wonderland is my all time favorite. Anything with it as a theme is added list of loves! Great job! This turned out so great! You should be really proud of your freehand work!!!! You're so creative! I love these! especially because you did them without acrylic!! mad! This is super creative and awesome!!!!! You are seriously talented wow. I think I'm gonna re read the book, haven't done that in years! I love the clock! Awesome! The flamingo is the best!!!!! I am putting that into my mental list of future ideas. you should have won Sarah !! Love itttt. It's like brief snatches of the movie on your fingers. So cute! OK, now I'm just freaked out!! 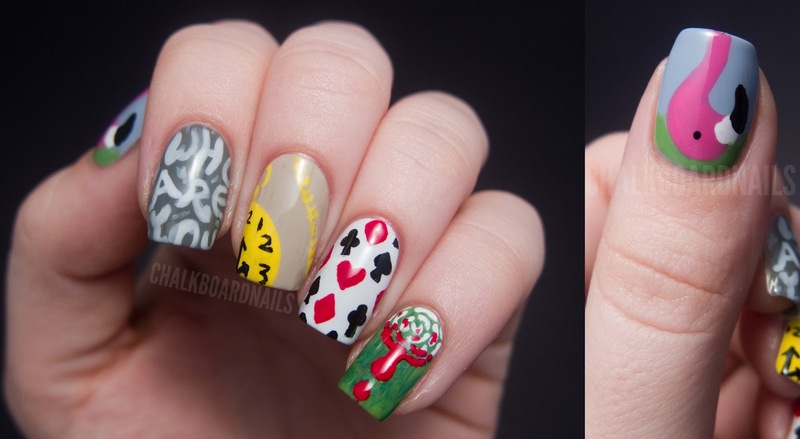 I haven't checked any blogs in the last day or so, and just yesterday I came up with an idea for some Alice themed nails and did them on one of my nail wheels... and they were painting the roses red themed.... LOL weird! Same wavelength or what!! Love these, especially the flamingo haha! this is so cute - congrats on 2nd place! The detail in this... *sigh* it's gorgeous! 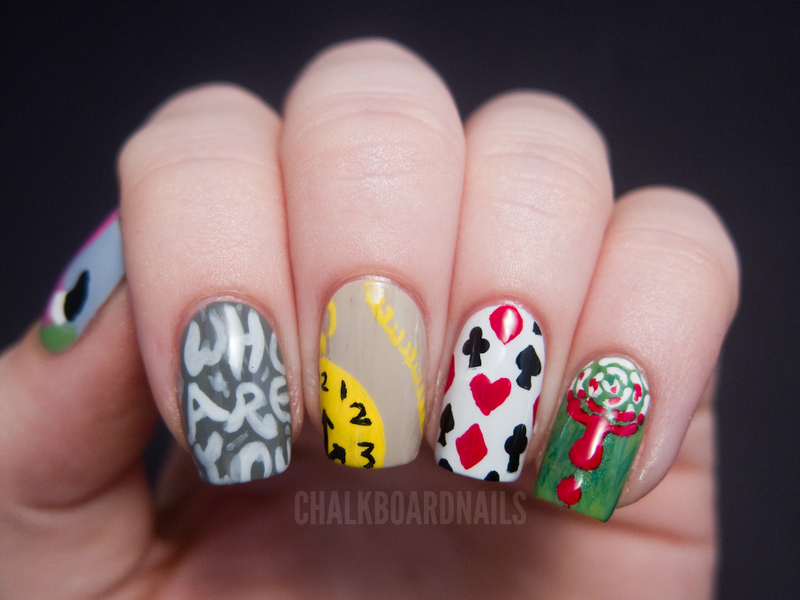 Best Alice in Wonderland nails EVER! You should got first!